Alright, let's start picking out parts! Again, let's start with the tank and move forward towards the engine. The tank is well… a tank. It holds the nitrous oxide and without it, we run out of fun fuel. Let's look at types of tanks. As I mentioned, nitrous oxide tanks are kinda pricey because they aren’t made in incredible volume. In order to keep our prices down, I am looking at CO2 tanks since they can handle the pressure we’re looking at dealing with. This opens a plethora of options for tanks. Welding supply houses have CO2 tanks, home brewing places have tanks, paintball places have tanks, and soda making machines use smaller CO2 tanks as well. Scuba tanks would also work, but tend to be a lot pricier. All of the tanks I have seen have what is called a burst disc. If the pressure gets too high in the tank, it cracks the burst disc and the gas gets vented to the atmosphere before the tank goes boom. If we put the tank in the cabin, we must vent this gas outside the cabin. So, the easier solution is to not put it in the cabin. Next, let's talk about hydro testing. Each tank capable of handling those high pressures is hydro tested. I’m not sure what that all means, but I know that a tanks certification lasts 5 years, and then the tank has to be retested to ensure its up to the task of handling the high pressure it will be under. If getting a used tank, you must be aware of this. Places will not fill your tank with an expired certification. How big of a tank do we need? This is highly variable depending on how often you use nitrous, and how much power you get from the nitrous. The rule of thumb I found online was: “.8 lbs per 100hp per 10 seconds”. This was off the ZEX site or something like that. For our example, I am aiming for a 25 hp shot. I was hoping to be able to fit a 5 lb tank in the car. According to that formula, a 5 lb tank would last over 4 minutes of nitrous use. If we are only doing a 10 hp shot, we get nearly 11 minutes of boost. That's pretty darn long. However, I have since found out that the large paintball tanks are actually really cheap, and fit much easier where I hope to fit them. So, I am now looking at a 1.5 lb tank instead. This gives about 1.25 minutes of nitrous use at 25 hp, and a bit over 3 minutes at 10 hp. Refilling cost. Ah, the only real downside to nitrous. Yep, eventually we will run out and have to refill the tank. I called around for a while the other day trying to find places that would fill up a tank for me. I called welding supply places, medical places, and finally speed shops. The only place that would sell to me were the speed shops. There is some red tape with using nitrous oxide due to the fact you can get high off the stuff, so it is fairly regulated. In any case, the 3 local speed shops I talked with ranged from $6 per pound to $7.50 per pound. Tank valves. Different tanks have different valves. Home brew places seem to use the CGA-320 valve. Real nitrous oxide tanks use a CGA-326 valve which is slightly different. Paintball tanks use a pin valve and some threaded connection. Soda machines use a similar pin valve, but use a much coarser thread. For our purposes, we don’t really care too much about what valve we have on the tank. We just need to be able to get an adapter that converts it to NPT style thread so we can put standard fittings on it. The local speed shops didn’t seem to have much issue filling up a CO2 tank either. One said they didn’t like to, but didn’t say they wouldn’t. Tank siphon tube. In a nitrous oxide system, you are sucking up liquid nitrous oxide, not the gas. This means that you have a choice of mounting the bottle upside down, or adding a siphon tube so it pulls liquid nitrogen oxide from the bottom of the tank. I plan on going the simpler route and mounting the tank upside down. Tank temperature and pressure. The tank pressure is completely controlled by the temperature of the tank. The gaseous nitrous oxide is what is pushing against the liquid nitrous oxide in the tank. The warmer we get things, the more nitrous converts to gas, and thus the pressure increases. Higher pressure will inject more nitrous oxide. In order to get the flow we want, we have to either correct the jet size for the tank temperature, or warm or cool the tank itself. More heat means more pressure regardless of how full the tank is. 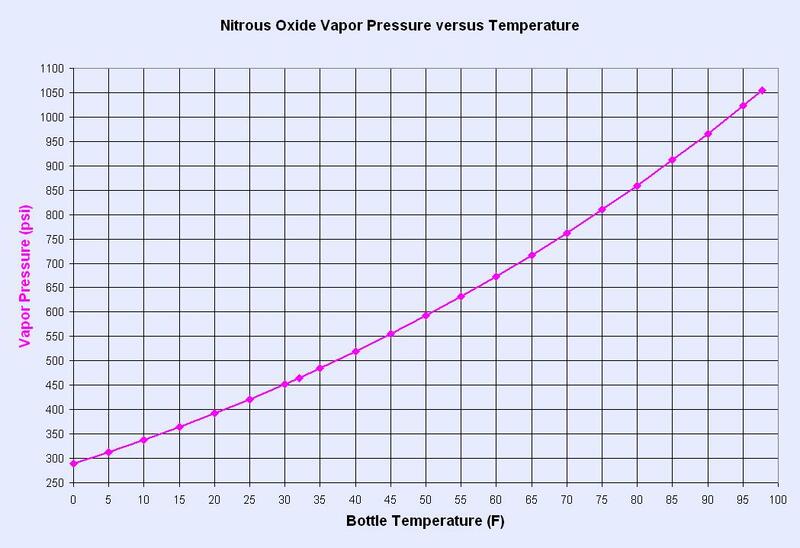 Above we can see a chart of the temperature vs pressure relationship. For my system, I’ve decided on a 1.5 lb paintball co2 tank with a pin valve. I really wanted something larger, but with the place I have in mind, I simply couldn’t find a larger tank that fit. The other perk of this tank is its price tag. Amazon has it for $22 shipped. Its kind of hard to beat that. All of the larger tanks are at more than 2x that price. However, we will also need what they call a fill station adapter. This part pushes the pin down on the valve to open it up. The outlet is ⅛” npt and it also has a nice little pressure gauge on it. All for the small price tag of $13. Okay… that was a lot longer than I hoped for. We’ll stop there for the day. But, tank selection is very important. We need it to be safe as we are dealing with really high pressures. Next up on the parts list is fittings and high pressure tubing that goes to the nitrous solenoid. All of these parts are subject to full tank pressure. This means they could see over 1000 psi, and therefore must be rated for that pressure. Brass adapters are readily available that can handle this, they just cost a bit more than the regular low pressure ones. Mcmaster Carr has a nice selection. I believe they’re called extreme high pressure fittings. As for the high pressure tubing, we’re looking at braided stainless steel tubing. Mcmaster Carr (mcmaster.com) sells this stuff for just under $5 per foot. This is the same stuff that braided brake lines are made of and can handle 1500 psi. The ends are also a little pricey at $9 per end for a male ⅛” npt fitting. Larger fittings cost more. Alternatively, you could also use steel or aluminum brake line. You would have to bend it all by hand which isn’t that big of a deal, but it would make bottle replacement more of a pain for sure. For my setup, I plan to pretty much eliminate nearly all of this stuff. I am planning on mounting the solenoid right off of the valve. I’ll just need a high pressure ⅛” npt male to ¼” npt male adapter to go from the valve directly to the solenoid. The adapter costs a total of $5.50. However, if you want to go with a bigger tank, you’d definitely need to use tubing of some form to get the nitrous from wherever you mount the tank, up to the solenoid which should be very near the engine. You do not want to mount the solenoid in the back of the car along with the tank. You want it as close to the intake as reasonably possible. I can't stop thinking of a Mirage in a Fast and Furious movie. Hilarious! I am very intrigued on your results. Haha, yeah that would be pretty funny. At first, I was just going to run through how you can build the system for ~$150. But, as I dove into the parts list a bit more and saw you could get the price down to around $100, I just had to try it out. Do you think you'll run into problems trying to get a paintball tank filled with nitrous? Or just make up your own sticker to slap on the bottle see what happens? That is a great question. When I was looking into where to get my tank / bottle filled up, I called up and talked with two speed shops that sell nitrous oxide. The first seemed wishy washy about filling CO2 tanks with N2O. They said they didn't like to, but that they have filled CO2 tanks. The guy I talked with said he had heard some bad stories about CO2 tanks having issues. The other place that I contacted did not seem to care at all. I think they just recently got certified to sell nitrous though, and are eager to get sales. They also seemed to actually HAVE nitrous on hand. When talking with people (weld supply shops, speed shops, etc), automotive nitrous seems to be a seasonal item. Its typically used on drag cars, and not too many people are drag racing during January in Wisconsin. The first shop said that they wouldn't have any nitrous in stock again until sometime in April. The second shop didn't mention anything about having to wait. In reality, CO2 and N20 use the exact same tanks. They also will both incorporate a burst valve. The only real difference between the two is the valve that screws into the tank, and what fitting screws into that valve. So, it shouldn't be a problem. However, if you're thinking of doing something similar to this, I would definitely call around and check with your speed shop first. Excellent question. Thanks for asking! I miss some of these things as I go about this whole process. Now, let's look at picking out solenoid valves. We will start with the nitrous valve because it is a bit more complicated. The nitrous solenoid valve has to be able to switch 1000+ psi on and off. This sounds like no simple task, right? Right off, we could make this super easy and just buy a nitrous solenoid valve from one of the nitrous oxide kit brands. They are purpose built to handle that high pressure and would definitely be the easiest way to go. These solenoid valves aren’t cheap of course, and start at around $60. That is half the budget for my build, so I am not going that route. For my setup, I am planning on doing what is recommended on nitrous.info. He takes normal pneumatic (air) solenoid valves which are rated for ~140 psi and modifies them to work at a much higher pressure. Pneumatic solenoid valves can be had on amazon for $15. Modifying them takes a couple more bucks of materials, but is actually pretty simple. This is the solenoid valve I went with. I would have liked to get one with ⅛” npt ports, but I was not able to find one as cheap, and with decent reviews. I went with this design because it has a solid brass body, not aluminum or plastic like some other solenoid valves. It also runs on 12V which is kind of a duh as we are working with a car which only has 12V available. However, nitrous.info does recommend going with a 6V solenoid valve and running it on 12V if you are running higher power outputs. Your solenoid will need a bit more oomph to open up. It also has viton seals, so I can use the same solenoid for the fuel if I decide to make this a wet setup. This solenoid valve will need to be modified to run nitrous through it. I will go through the modification of the solenoid in another post as there is a good bit to explain there. Thankfully, it's really not that complicated. There isn’t really a lot to these valves, which explains why you can get one for $15. Next up, let's talk about the fuel solenoid. This is much easier to figure out. Again, nitrous.info recommends a pneumatic solenoid valve. These solenoid valves are already rated for more pressure than they will see while in use since our fuel system runs on ~43 psi. So, pressure is not a problem. The main consideration here is the sealing or gasket material. You need to use a material that is compatible with gasoline. Normal rubber will not work. You want viton, or nitrile (buna-n), or teflon. Here is a link to a nice chart that shows what will work with gasoline, and I took a screenshot below too. From here on out, things get a lot easier. We are no longer dealing with any crazy pressures. We’re just routing the fluids to the intake tract. For this we can use some nylon tubing. It's pretty inexpensive, and it’ll do what we need it to. This is the stuff I am going to use. It's still rated at 800 psi which is probably total overkill, but it's also just about the cheapest thing I could find that was nylon. Nitrous.info recommended nylon, so I’m going to stick with it. To connect the nylon tubing we’ll simply use the compression fittings that Mcmaster Carr recommends for that tubing. Alternatively, you can use the push-to-connect fittings, but I figure a compression fitting will be a bit better in the long run. I’ll need a ¼” npt fitting for the solenoid valve. For the intake side of things, I’ll use smaller ⅛” npt fittings. I want to make it as small as possible just because I’ll be able to fit it in a smaller area and orient the fittings properly for a wet system if necessary. If you do a wet system, you want the nitrous to spray over the stream of fuel to help atomize it so it evenly distributes to each cylinder. Here is a little diagram from nitrous.info. I imagine I’ll be able to 3d print some sort of part that mimics this. The smaller fittings will allow me to get things closer together and reduce the size of the whole package. I’m hoping to integrate this right into the OE intake setup. I’d rather not go about customizing a ton of stuff for this. If it works out, I can always improve the setup. We need to go over a couple things now before we start putting this system together. Let's talk about how the addition of nitrous effects the engine, and some of the design considerations we must take into account. So, what is the nitrous doing? Its essentially chemically supercharging the engine. It’s adding more oxygen into it than is normally possible. So, it's going to react similar to supercharging. When you start cramming more air and fuel into the engine, at some point you need to start retarding the ignition timing to prevent knock. However, we do not have this capability, so we will just have to do our best. This means we will have to limit the amount of nitrous we can inject without retarding the ignition timing. With that in mind, we need to figure out where to inject the nitrous. Individual port injection sounds pretty snazzy, but I’m planning on injecting the nitrous right after the MAF sensor. This will do a few things. Firstly, and probably most importantly, it bypasses the intake air temperature sensor. As nitrous is injected, it cools off the intake air big time. Cold air makes the engine advance ignition timing, and that is the opposite of what we want. So, if we at least inject after the MAF, we can avoid ignition advance. I am a little nervous about injecting after the MAF because now we’re putting air (oxygen) into the engine that isn’t metered. However, nitrous isn’t air anyways. Its oxygen content is way higher. So, the MAF wouldn’t be metering things correctly anyways. I’d honestly like some input on this thinking as it's basically the only place I think I might have issues. Of course, those issues can be resolved with a wet system, which I think I will eventually go to. Edit: The consensus from the OE nitrous makers is a dry shot goes before the MAF, a wet shot goes after the MAF.